And finally, I spray Lola by Marc Jacobs Eau De Parfum all over which leaves my skin wrapped in sensuous florals all day long. I use step 7 and 8 to sculpt my face. The basic sculpting method involves highlighting and contouring the face. Basically, everything you highlight comes forward and everything you contour stays in the background. It is actually a trick to make you look thinner and make your face appear Oval in shape (which is the ideal face shape). 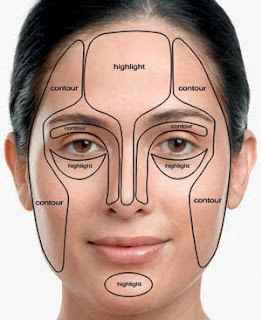 The image above depicts places to highlight and contour. Will post more on this later.